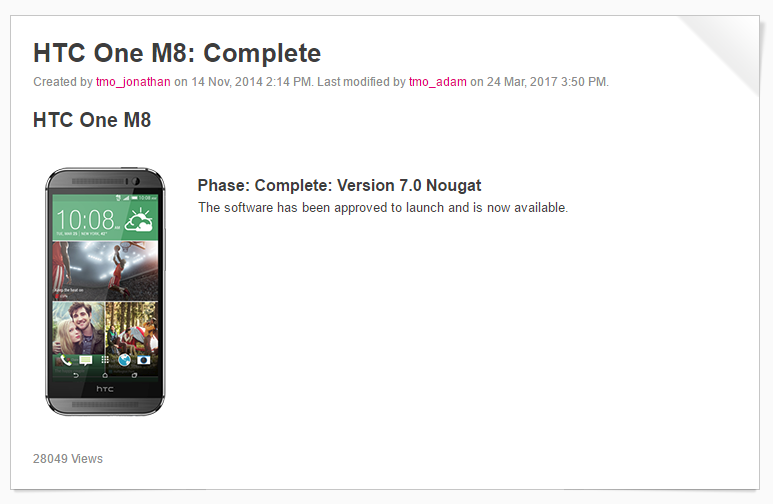 Update [March 27, 2017]: We just received confirmation from a T-Mobile rep and it seems they mistakenly updated the HTC One M8 page with the mention of Android 7.0 Nougat update being rolled out for it. T-Mobile will have it corrected soon. So it’s not happening, phew! The waiting period for HTC One M8 users expecting Nougat update is going to be over pretty soon. However, this will be only for those on T-Mobile network. The Magenta carrier is all set to roll out the Nougat update to HTC One M8 units and it can happen anytime now. Successor to HTC One M7, the One M8 was launched way back in 2014 with Android KitKat OS on board which was later bumped up to Android Marshmallow. Although, HTC One M8 users on T-Mobile are lucky enough to get a taste of Nougat, those using unlocked versions will not be that fortunate as the Taiwanese company has earlier ruled out the possibility of releasing Nougat update to One M8. T-Mobile, on the other hand, has announced via its official website that the Android 7.0 Nougat software for HTC One M8 has been approved to launch and is now available. As such, expect it to hit your HTC device anytime now.